5 photos: “Swing,” “The Bells Tools,” “Freedom Calls, “Spirits of Things” & “Guardian/Protector,” in Moko Jumbies: Guardians & Protectors Group Show, CMCArts. Frederiksted, St. Croix, January- February 2013 & The Steeple Building, March-May, 2013. 2 photos: 1 B&W, “After School Dare,” and “Elders,” In group show, A Choice of Weapons: The New Renaissance Artist 2 119SEIU Gallery, New York, April 25, 2012-May 30, 2012. 12 color photos, “Another Haiti,” pictures taken in January 2011 in Port a Prince, Haiti,@ MFA Gallery, California College of the Arts, San Francisco, November- December , 2011. 40 color photos, “The Intricacies of Culture Revisited,” @ Studio One, Oakland, Ca., May 1 – June 3, 2009. 1 color photos, “Grooving on the Green,” In The Art of the Living Black 13th Annual Bay Area Black Artist Exhibition, Richmond Art Center, Ca, February – March, 2007. 2 color photos, “Chaining It Up,” & “Love Is” in Resilience: My Culture, My People, Me! The African American Center of the San Francisco Public Library, August-October 2008. 1 color photo collage, “A Glimpse of Egypt,” in California College of the Arts Faculty Exhibition, Ca., September 2-10, 2008. 38 color photos, “Feeling Home Everywhere,” from Brazil, Cuba, Jamaica, Trinidad, South Africa & South Carolina, In YWCA, Berkeley, Ca., February 5-April 5, 2008. I color photo, “Some Jamaican Men,” In The Art of the Living Black 12th Annual Bay Area Black Artist Exhibition, Richmond Art Center, Ca, February 5, – March 14, 2007. 2 color photos, “Ras Meets Jah,’ & “The Farmer,” In Push Play at the Oakpod Gallery, Oakland, August-September, 2007. 1 color collage photo, “The Priestess & Her Wares,” In The Art of the Living Black 11th Annual Bay Area Black Artist Exhibition, Richmond Art Center, Ca, February 3, – March 15, 2007. 2 mixed-media pieces, “Inside the teeth of Love” & “So This is It,” in traveling exhibit, “Afetos Roubados No Tempo” curated by Dr. Virginia Gordihlho Martins, Salvador, Bahia, March –September (different cites throughout Brazil before if final destination in South Africa) 2006. 4 pieces in Conversations/Conversaciones: Women Collaborate, de Saisset Museum, Santa Clara University, January 17-March 14, 2004. “Working Man,” photo/poem, In the Art of Living Black 2004, January 28-March 20, 2004, Richmond Art Center, Ca. “The Orisha Bottle Series,” 2002 Juried Group Show at Pro Arts, Oakland, Ca., October 18, 2002 – February 1, 2003. “Cuban Series, I-IV,” photographs with poem, Faculty Group Show, California College of Arts & Crafts, Oakland, CA., September 9-14, 2002. “Amandala/Power” artist-in-resident group show, Tryon Center for the Visual Arts, Charlotte, N.C., September – December 2000. 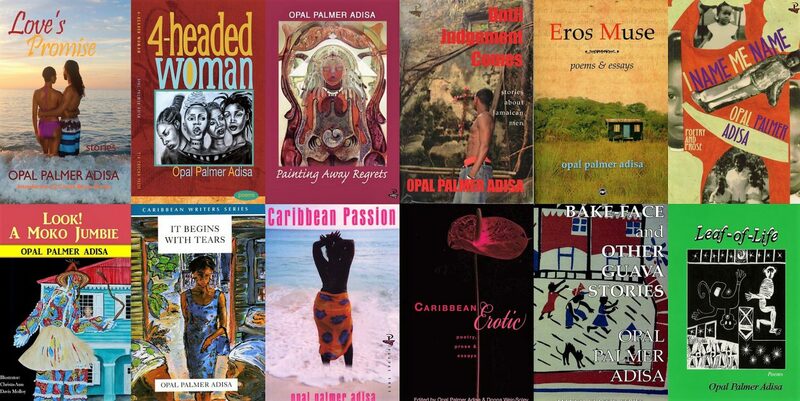 Caribbean Women: Big and Little, visual poetry (a collaborative effort with photography Kathy Sloane which combines her photographer of Caribbean women with my complementary poetry). This work was exhibited at The Women’s Resource Center, University of California at Berkeley, February, 1988 and at the Student Union Art Gallery, San Francisco State University, March 1988. “Kwanzaa Celebration” in group show, ART FOR THE HOLIDAYS, Bedford Gallery, Walnut Creek, CA., November 25, 1997-January 4, 1998. “Take Your Time,” in collaboration with Caryl Henry and Chapoo Alafonte in Building Bridges/Crossing Cultures Exhibition at Hearst Art Gallery, St Mary’s College, California, September-November 1996. “Envoys – Association of Women Artists International Postcard Project,” at Lopdell House Gallery, Waitakere City, New Zeland, April -May 1996. “Can You See Yourself,” & “Skin Deep” (photo, fabric, paper) in group show, (in)FORMING THE VISUAL: (re)PRESENTING WOMEN OF AFRICAN DESCENT at The Montgomery Gallery, Pomona College, CA., Jan 23-March 26, 1995. Moko Jumbies: Guardians & Protectors Group Show, 26 artists in different mediums, CMCArts. Frederiksted, St. Croix, January- February 2013 & The Steeple Building, March-May, 2013. Co-curated with Pamela Franco, “Contemporary West Indian Artists” at The African American Historical Society, San Francisco, CA., December 1983-February 1994. Eight Black & White photos of Jamaica in Edinburgh Review 123: Caribbean Logic, UK, 2008, pp. 53-60. Three color photo, Egypt & Jamaica in Colere, Issue 8, Iowa, 2008, cover and p. 14 & 50.